If you need information about a detainee that is housed at this facility, you may call (210) 231-4505 between the hours of 8 a.m. and 4 p.m. When you call, please have the individual’s biographical information, alien number, first, last and hyphenated names, any aliases he or she may use, date of birth and country of birth. Detainees cannot receive incoming calls. If you need to get in touch with a detainee to leave an urgent message, you must call (830) 334-2939 and leave the detainee’s full name, alien registration number and your name and telephone number where you can be reached. The detainee will be given your message. Parking: Free public parking is available at the facility (designated visitor parking is marked). 9 a.m. to 10 a.m.
3 p.m. to 4 p.m.
Detainees are allotted one hour for visitation. More time may be authorized by the Warden for family members traveling significant distances dependent upon the number of visitors and staff availability. Request forms are located inside dorms for detainees to make request. A maximum of two adults and two children may visit at any one time. This regulation will be interpreted flexibly and is subject to exceptions. To ensure adequate time to process visitors through security, all visitors should arrive 30 minutes prior to the scheduled visit time. Attorneys and/or paralegals may visit detainees daily from 7:00 A.M. until 9:00 P.M., including holidays. Consular officials may meet with their detained nationals at any time. It is requested that prior arrangements be made with the ICE Supervisory Deportation Officer to the extent possible, and that consular officials bring appropriate credentials when they come to the facility. 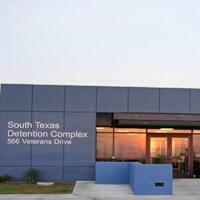 The ICE Supervisory Deportation Officer for this facility can be reached at (210) 231-4505. A detainee may receive items that are determined to be of necessity for the sole purpose of travel or release from agency custody with approval of the ICE Deportation Officer. A news media representative who desires to conduct an interview with a detainee must apply in writing to the Atlanta Field Office, Office of Enforcement and Removal Operations, indicating familiarity with and agreement to comply with the rules and regulations of the facility as provided to that person by staff. We strive to provide quality service to people in our custody, their family, friends, and to their official representatives. If you believe that we have not lived up to this commitment, we would like to know. If we have met or exceeded your expectations, please let us know that as well.